Mrs. Miniver (1942) is one of the 1001 classic movies you should see. It stars Walter Pidgeon and Greer Garson as an English couple living through World War II. Each Monday, I'm going to recommend a classic movie you should see (for the reasons behind the 1001 series and reviews of earlier films covered go here). 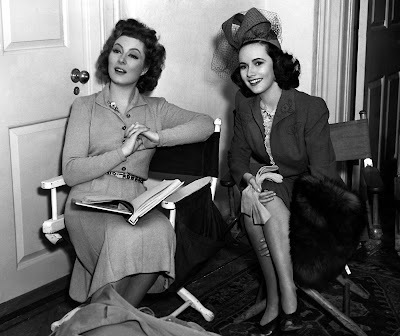 This month I'm writing about the leading ladies of 1942 starting with the Academy Award-winning performances of Greer Garson and Teresa Wright in Mrs. Miniver. Mrs. Miniver tells the story of Kay (Garson) and Clem Miniver (Walter Pidgeon), an ordinary English couple who live in the village of Belham with two of their three children (Christopher Severn and Clare Sandars). Suddenly, the Minivers' ordinary lives are turned upside down when Germany declares war on Great Britain. Their college-age son (Richard Ney) enlists in the Royal Air Force, Clem participates in the Dunkirk evacuation, and, most surprisingly, Kay finds a German pilot (Helmut Dantine) in her back yard. Mrs. Miniver was based on a series of newspaper columns about ordinary English life written by Jan Struther. MGM bought the rights to the characters for a film directed by William Wyler and starring MGM contract player Garson after both Norma Shearer and Ann Harding turned down the title role (neither lady wanted to appear as the mother of a grown son). The result was a huge hit that was released seven months after the U.S. entered World War II. It earned six Oscars and, according to British Prime Minister Winston Churchill the film's impact on the American public was worth "50 destroyers." 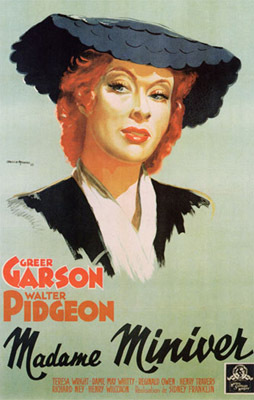 Although the title primarily refers to Garson's character, the film actually has two Mrs. Minivers. Teresa Wright, who was coming off a successful film debut in The Little Foxes (1941), plays an aristocratic young lady who falls for and eventually marries the Miniver's son, Vincent. Her tragic fate during the darkest days of The Blitz underscores the hardships the British endured in their fight against Nazi aggression. Both actresses earned Oscars for their work on Mrs. Miniver, and, while there was certainly an element of patriotism in the Oscar voting, Garson and Wright both gave stellar performances that defined their careers. 1. Miniver Rose. If you're a Downton Abbey fan, you know that the storyline involving the annual rose contest was repeated almost verbatim for the hit PBS TV series. 2. Dunkirk. The remarkable story of the evacuation of more than 300,000 Allied soldiers is coming to the big screen in 2017 courtesy of director Christopher Nolan. It was also a centerpiece of Mrs. Miniver with Clem joining a floating armada of fishing vessels and pleasure craft. 3. German soldier. MGM chief Louis B. Mayer and Wyler battled over the portrayal of the downed Luftwaffe flyer that Mrs. Miniver finds in her garden. Mayer, who didn't want to lose revenue from the European market, argued for a more sympathetic portrayal of the soldier while Wyler wanted the character to be one of "[Nazi Aviation Minister Hermann] Goring's little monsters." The director eventually won out after Germany declared war on the US in December 1941. 4. Final scene. One of the most powerful scenes in old Hollywood history, the sermon and prayer delivered by actor Henry Wilcoxon was widely printed and distributed by the order of President Franklin Roosevelt. Greer Garson and Teresa Wright on the set of Mrs. Miniver (1942). Other critics: Mrs. Miniver has a 92 percent fresh rating at Rotten Tomatoes and Leonard Maltin writes that "this film did much to rally support for our British allies during WW2, though its depiction of English life was decidedly Hollywoodized " in a 3.5-star review in his Classic Movie Guide. Critics in 1942 handed out rave reviews. The usually dyspeptic Bosley Crowther abandoned his usual cynicism to call it "one of the greatest films ever made" and "an exalting tribute" to the gallantry of ordinary British citizens comparing it favorably with Churchill's stirring speeches to the British Parliament. The bottom line: There's almost no old Hollywood film about World War II that can equal the impact of Mrs. Miniver. It builds from a gentle comedy about middle-class English life to, in its timeless final scene, a powerful act of defiance from a war-torn nation. 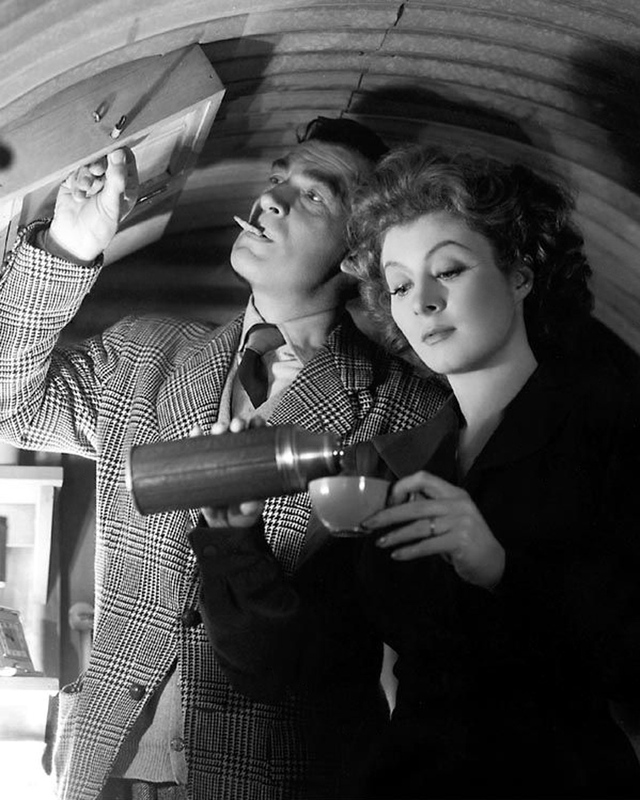 Availability: Mrs. Miniver will air at 11:30 a.m. June 13 on TCM. Also available on DVD and video on demand. Next week, I'll continue the May theme of the leading ladies of 1942 with Bette Davis and Gladys Cooper in the romantic melodrama Now, Voyager (1942). This article will be ready on Tuesday, so I can participate in a special giveaway from Flicker Alley.